Today is Bell Let’s Talk day and we want to join the dialogue by talking about mental health and parenting children with disabilities. Over the last decade, studies show that parents of children with a range of disabilities like cerebral palsy, autism and Down syndrome have higher rates of depression and stress than other parents. This 2013 Australian report provides a good overview of our unique mental health challenges: Enhancing support for the mental health of parents and carers of children with disability. Consider some of these contributing factors. Parenting a child who is devalued and marginalized in our culture can be heartbreaking. 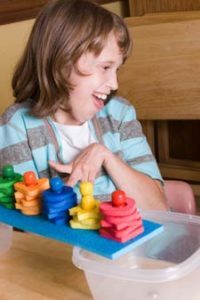 Parents of children with disabilities often have to fight to have their children included in everyday activities and regular school programs. Advocacy is time-consuming and emotionally exhausting. It’s sad when your child struggles to make friends. Parents may not be able to get the therapies their child needs covered publicly. Raising a child with a disability costs more. Often times, one parent needs to be at home. Some parents have experienced many traumatic, life-and-death situations with their child. Others have been with their child through dozens of painful surgeries and gruelling months of rehabilitation. Lack of home-care nursing and the need to care for a child around the clock can be physically exhausting. See Parents of ventilated kids risk own health due to sleep loss. It’s sad when many people don’t delight in your child the way you do, and see their beauty, value and wholeness. Recently, we’ve seen some exciting studies about interventions that can reduce stress and depression in parents like us. For example, in the last year we’ve written about three CAMH studies showing the benefits of mindfulness, self-compassion and acceptance and commitment therapy. The most recent: Accepting emotions reduces depression and stress in parents and Self-compassion may fuel parent resiliency. In 2014 there was this Pediatrics study: Peer-led groups treat distress in parents of kids with autism. Holland Bloorview’s Dear Everybody campaign aims to help the public understand the experiences of disabled children and their families, and to reduce stigma. Here are some of the responses (edited for space). Post-traumatic stress disorder is now recognized in first responders. Living through repeated life-and-death situations with your own child takes a toll. The world should know that we worry constantly and that it can be exhausting. I love our daughter to death and she brings us so much joy, but the stress and worry about her future can be debilitating. Except—it actually can’t be, because you just carry on. You have no choice. I worry that this reality takes a toll. Hopes, dreams and fulfillment for our children are waylaid for doctor appointments, constant phone calls about denied necessities, hospitalizations, Emergency visits, sleepless nights, loneliness, lack of freedom, but most of all guilt. Did we do enough? What did we forget? Are we paying enough attention? The list is endless, but at the top of that list should be FEAR. Who will be there to carry on for our child when we can’t? I have never gotten over the trauma of our daughter’s early birth and the subsequent turn she took after birth that led to her disability. We may always look like we have it together, but placating us with ‘You seem to be very strong’ pushes us further into the dark and away from help. We need proper assessment. Don’t leave it till we fall off the rails. Studies show that parents like us have higher rates of depression and anxiety than other parents. There is the everyday worry I have for her health and wellbeing, both physical and mental. I constantly worry about what happens to her in the future. Will I be well enough to take care of her, or will she be able to live a somewhat independent life? Oh, and let’s not forget the worries of possible abuse of my girl—physical, mental and sexual. Our lives are mentally exhausting!